LAWA joins worldwide effort to raise conservation and climate awareness. The pylons, which line 1.5 miles of Century Boulevard, and grow in height from 25 to 60 feet before culminating in a ring of 15, 100-foot columns at the entrance to LAX, will be lit green before going dark, from 8:30-9:30 p.m. in unison with lights at other city-owned buildings and famed structures across Los Angeles and around the world. Lighting required for public safety will not be turned off during the event and airport operations will not be affected. "Led by the vision of Mayor Garcetti, LAX and Van Nuys airports have become true leaders in sustainability," said Sean Burton, President, Los Angeles Board of Airport Commissioners. 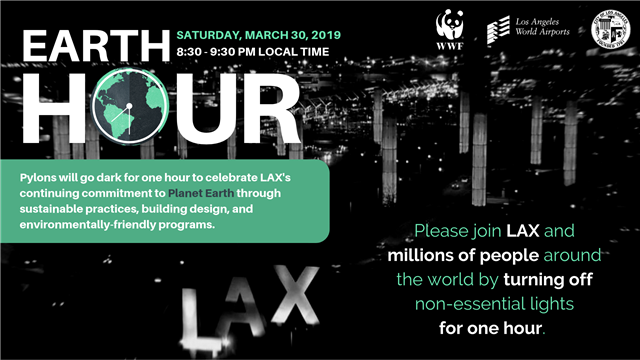 "Earth Hour is an opportunity for everyone to reduce their own carbon footprints with just the flip of a switch or the unplugging of a charger, and Los Angeles World Airports is pleased to join in this effort." In April 2018, the Los Angeles Board of Airport Commissioners approved the purchase of 20 all-electric buses for guest conveyance across LAX airfields. The new buses will allow LAWA to reduce its carbon footprint by 616,365 pounds per year of greenhouse gases (GHG) while ensuring that guests enjoy comfortable, emissions-free rides between the terminals and remote gates. Delivery is anticipated for later this year. In September 2018, Airports Council International-Europe reaffirmed the commitment of both LAX and Van Nuys (VNY) airports to reduce their carbon footprints by continuing Airport Carbon Accreditation for both airports. LAX is currently accredited at "Level 3 - Optimization," which recognizes LAWA's efforts to account for and reduce emissions made not only by LAWA-owned resources, but also those of businesses operating at LAX. VNY is currently accredited at "Level 2 - Reduction" for its efforts to reduce carbon emissions from LAWA-owned facilities at that airport. LAWA is working to reduce LAX's GHG emissions to 45 percent of 1990 levels by 2025, and VNY's emissions released by LAWA-owned and operated properties to 5 percent of 2013 levels by 2025. In October 2018, LAWA was recognized as a Business Leader in Air Quality by the South Coast Air Quality Management District. The award recognized all of LAWA's air quality-focused initiatives, with special mention of its electric vehicle purchasing and overall GHG emissions reduction commitments. Also in October, LAWA and stakeholder-led efforts at VNY led to the operational launch of the first of seven solar rooftop and canopy power generation installations. This marks the first installment of solar power generation at a LAWA airport. Upon completion of all seven projects, VNY will become one of California's leading general aviation airports for solar energy production, producing a combined approximate total of 44.6 million kilowatt-hours annually – enough to power about 8,000 homes each year. In addition, the projects will annually reduce more than 73.3 million pounds of carbon dioxide emissions. In December 2018, the Los Angeles Sustainability Coalition awarded LAWA its 2018 Public Agency of the Year Award for its efforts in developing the Automated People Mover (APM). The coalition recognized the potential benefits of the APM to relieve traffic congestion for L.A.'s roads by establishing direct connection to Los Angeles County Metropolitan Transportation Authority's light rail system. The project is expected to eliminate 117,000 vehicle miles traveled, per day, when the APM is in operation. International Earth Hour began in Sydney, Australia, in 2007 with a single lights-off event. Since then, the occasion has grown into an observance recognized in more than 7,000 cities in 187 countries and territories with thousands of monuments turning off their lights in 2017. The public and businesses are encouraged to participate by turning off non-essential lighting for one hour in support of actions to combat global warming and encourage a cleaner, safer, and more sustainable future. Learn more about Earth Hour here: https://www.earthhour.org/. Los Angeles World Airports (LAWA) is the City of Los Angeles department that owns and operates Los Angeles International (LAX) and Van Nuys (VNY) general aviation airports, as well as aviation-related property in Palmdale. Both play an integral role in helping to meet the Southern California regional demand for passenger, cargo and general aviation service. Both airports make a distinct contribution to the strength of the system as it provides a high level of safety, security and service for its customers, communities and stakeholders. More information can be found at flylax.com. As a covered entity under Title II of the Americans with Disabilities Act, the City of Los Angeles does not discriminate on the basis of disability and, upon request, will provide reasonable accommodation to ensure equal access to its programs, services, and activities. Alternative formats in large print, braille, audio, and other forms (if possible) will be provided upon request.